Arkansas Car Insurance Quotes « Car Insurance Calculator – Car Insurance Estimator for You! Nearly all car insurance policies have a provision that will adjust your coverage from the minimums required in your state to the minimum insurance or proof of financial responsibility in another U.S. state. So you do not need to get a new insurance policy for each state you are driving through. However, if you buy a policy in a low limits state (like Arkansas) but live in a high limits state (like Alaska), insurers will only write a policy where your car is principally garaged. So if your home is in Alaska, you should buy the minimum limits for Alaska. Arkansas’ required insurance limits, especially for personal injury damages, are low considering the cost of damages likely to occur in an accident. If you are in a serious collision and the damages you caused are greater than the coverage limits you purchased, you may be personally liable to pay for those damages that exceed your insurance coverage. Arkansas is a modified comparative negligence state, which means there is no recovery if you are 50% or more at fault. The fault of the claiming party is compared to the fault of all parties from whom recovery is sought. As an example, you may recover damages if you were 49 percent or less at fault, but your recovery is reduced by your degree of fault. 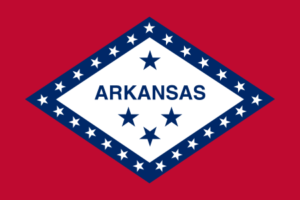 In Arkansas, Driving Under the Influence (or DUI) is a misdemeanor. The Blood Alcohol Content (BAC) limit is set at 0.08% for drivers over 21 years of age and it is set at 0.02% for those under 21. You will automatically have your license suspended for 6 months (although you can apply for a restricted license for work or school but you may be required to use an ignition interlock device.) You will have mandatory treatment or screening for alcohol or substance abuse. Penalties may include from 1 day to up to 1 year in jail, fines from $150-$1000 plus additional cost of any probation, sentencing, or ignition interlock device. Sentencing will be enhanced if a child under 16 is in the vehicle. An SR-22 or FR-44 is required for two years after reinstatement. The minimum jail sentence is 7 days and as long as 1 year. You will automatically have your license suspended for 2 year for a second conviction, allowing a restricted license after 45 days with an ignition interlock device. An SR-22 or FR-44 is required for two years after reinstatement. A court will mandate treatment for alcohol or substance abuse and attendance at a victim impact panel. Fines range from $400-$3000 plus additional cost of any alternative sentence arrangement. Farm Bureau Mutual Insurance Company of Arkansas Inc.